Right now on Amazon you can grab this Miracle Bubbles Solution Refill, 64-Ounce Bottle Colors at it’s lowest price ever- under $4. MILLIONS OF BUBBLES – The 64 oz. jug of non-toxic Miracle Bubbles bubble solution refill is enough to create millions of bubbles, making for hours of fun for kids of all ages. PRODUCES OVERSIZED BUBBLES – Premium soap bubble formula is guaranteed to produce oversized bubbles that will drift in the air and reflect light for a rainbow prism effect. 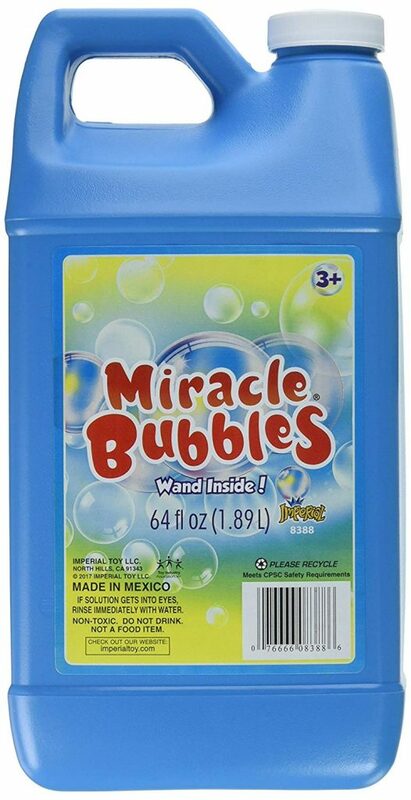 GREAT FOR BUBBLE MACHINES – Miracle Bubbles solution is the perfect refill liquid for a home or professional bubble machine. REFILL KIDS BUBBLE TOYS – Keep a jug on hand to refill smaller bottles of bubbles, bubble guns and bubble wands all summer long. FIND YOUR INSPIRATION – Since 1954, Darice has been inspiring creativity with the best value and selection of art and craft supplies for every level crafter. From scrapbooking to jewelry making, kids’ crafts to fine art, floral design to your latest Pinterest project, Darice has over 45,000 items for every level of crafter.